Here's where to purchase them all. You spend a third of your life in your bed, so why not make it as luxe as possible? In the quest for the absolute deepest, most restorative sleep, it’s all about mimicking that #HotelLife. With high-quality sheets, blackout shades or curtains, and some serious A/C, you can recreate your last vacation in the comfort of your own home… but for a fully immersive experience, you’ll want to invest in a hotel-procured mattress, so that every day will feel like a spa day. Here, the best hotel beds you can buy. High-class hotel chain 1 Hotels focuses on sustainable, eco-friendly living. While an e-commerce site is in the works for next year, the brand offers a way to buy their chic mattresses online, courtesy of environmentally-friendly brand Keetsa. Called the Tea Leaf Dream, it features a blend of hemp and fabric. Keetsa has even upped the ante by replacing the petroleum oil found in traditional mattresses with castor bean oil, allowing for less exposure to potentially dangerous toxins. Adorably called ‘Hilton to Home,’ The Hilton’s online shop includes everything from a luxe silk pattern design to extra coil support in order to prevent edge breakdown. You can even up your purchase with a selection of premium Hilton linens, available in a variety of colors and thread counts. Millennials will also want to check out Tru by Hilton, the hotel chain’s younger model. The NYC-born chain has expanded all over (most recently to New Orleans), and one thing it hasn’t skimped on is its luxury bedding. Created in partnership with Suite Sleep, this option is outfitted with 100 percent natural latex rubber, as well as a quilted organic cotton cover and wool batting for extra softness. It might feel a little unconventional, but the results speak for themselves. Why buy a positively pedestrian bed when you can be puttin’ on the ritz every night as you slumber? Manufactured by Stearns & Foster, this mattress boasts breathable silk and wool fiber fabric, and comes complete with cooling gel-infused memory foam layers. And while you can get pretty much all sizes from California king to twin, there’s one you can’t: the double king beds exclusively found at Ritz Carlton’s Phulay Bay in Krabi, Thailand. Maybe a trip is in order? Made exclusively for Four Seasons, this Simmons mattress boasts a customizable plush topper for a bespoke bed experience. A patented gel touch allows for heat absorption and max temperature control, making sure you never sleep too hot or too cold. Not only is the bed at Miraval utterly restorative, it also features the most comfortable sheets and pillows in all the land. The good news? You can purchase the entire package on the site. The not so good news? It’ll run you $5,266 for everything. But the spa-like sleep you get might just be worth the splurge. This bed might be a more budget-friendly option, but it doesn’t skimp on comfort. Uniquely designed with a plush pillow top cover, it lets you sink into it for a deeply restorative night of sleep. Heavenly, indeed. With cashmere quilting, a plush pillow top, and a cushiony surface, St. Regis’s signature construction eliminates motion transfer while you rest. The hotel also offers an option to purchase its complete bedding set for the ultimate luxurious sleep experience, once you’re ensconced back at home. The best part of this hotel chain’s slumber situation is that even at its other franchises, like TownePlace Suites and JW Marriott, the mattress level is consistently exemplary. The mattress box springs offer ultimate comfort, and you can even shop additional amenities like pillows and sheets online. At The Langham Huntington, Pasadena and The Langham Chicago, the Langham mattress is available to buy through each hotel’s purchasing department, with prices starting at $2,000. 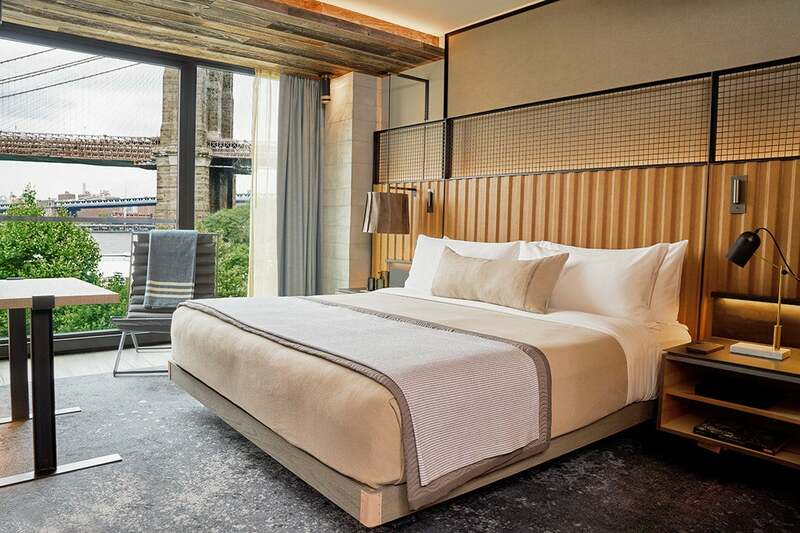 At Langham Place, New York, the majority of the guest rooms and suites feature The DUX Bed by Duxiana, which has a showroom in midtown. Though not available online, the hotel can work with you to arrange for the purchase of an identical bed through the Duxiana sales team. This post was originally published on June 11, 2017. It has been updated with new information.